In the previous article, we skimmed the surface of automated text parsing and set the stage for our impending exploration of the GLL algorithm itself. However, before we can move ahead and do just that, we should first build up some idea of what the requirements are for truly generalized parsing and what sort of problems we are likely to encounter. I’m going to assume you already have a working understanding of context-free grammars and how to read them. If you don’t, then I recommend you to the Wikipedia page on CFGs. Specifically, the examples are quite instructive. In this grammar, the S non-terminal is recursive because one of its productions refers back to itself. Specifically, the first rule corresponding to the S non-terminal is of the form α S β, where α and β stand for some arbitrary rule fragments (in this case, '(' and ')', respectively). In this grammar, the E non-terminal is left-recursive in two of its three productions. Left-recursion is a particularly significant property of a grammar because it means that any left-to-right parse process would need to parse E by first parsing E itself, and then parsing '+' and finally N (assuming that the parser is using the first production). As you can imagine, it would be very easy for a naïve parsing algorithm to get into an infinite loop, trying to parse E by first parsing E, which requires parsing E, which requires parsing E, etc. Notice how the second production for B is empty? This means that B can map to ε, and thus A exhibits hidden left-recursion. 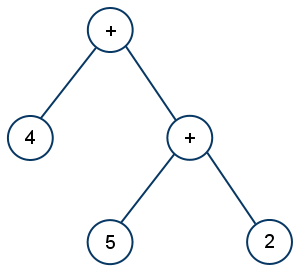 The difference between hidden and direct left-recursion is that hidden left-recursion is obscured by other rules in the grammar. If we didn’t know that B had the potential to produce the empty string, then we would never have realized that A is left-recursive. LR parsing algorithms (such as tabular LALR or recursive-ascent) can handle direct left-recursion without a problem. However, not even Tomita’s GLR can handle hidden left-recursion (which technically means that the GLR algorithm isn’t fully general). Hidden left-recursion is a perfectly valid property for a context-free grammar to exhibit, and so in order to be fully general, a parsing algorithm must be able to handle it. As it turns out, this is just a little bit troublesome, and many papers on parsing algorithms spend a large majority of their time trying to explain how they handle hidden left-recursion. It’s worth noting that left-recursion cannot be handled by top-down algorithms (such as tabular LL(k) or recursive-descent) without fairly significant contortions. However, such algorithms have no trouble at all with other forms of recursion (such as our original recursive example with S). 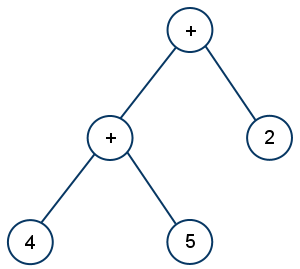 Left-recursion arises very naturally in many grammars (particularly involving binary forms such as object-oriented method dispatch or mathematical operators) and is one of the primary reasons why many people prefer algorithms in the LR family over LL algorithms. Literally, the question is whether or not we first expand the left or the right E in the top-level + expression. Expanding the left E will give us the tree to the left, where the first two operands (4 and 5) are added together with the final result being added to 2. Expanding the right E gives us the tree to the right, where we add 5 and 2 together, adding that to 4. Of course, in the case of addition, associativity doesn’t matter too much, we get the same answer either way. However, if this were division, then associativity could make all the difference in the world. (4 / 5) / 2 = 0.4, but 4 / (5 / 2) = 1.6. The point is that we can follow all of the rules set forth by the grammar and arrive at two very different answers. This is the essence of ambiguity, and it poses endless problems for most parsing algorithms. Clearly, this is a contrived grammar. However, it’s still a valid CFG that a generalized parsing algorithm would need to be able to handle. The problem is that there are an exponential number of possible parse trees for any given (valid) input. If the parser were to naïvely follow each and every one of these possibilities one at a time, even on a short string, the parse process would take more time than is left in the age of the universe as we know it. Obviously, that’s not an option. As you can see, generalized parsing has some very thorny problems to solve. It’s really no wonder that the algorithms tend to be cryptic and difficult to understand. However, this is not to say that the problems are insurmountable. There are some very elegant and easy-to-understand algorithms for solving these problems, and GLL is one of them. In the next article, we will start looking at the GLL algorithm itself, along with that chronically under-documented data structure at its core, the graph-structured stack (GSS). I’m learning about some newer parsing techniques and I just wanted to ask, is GLL the same or similar to Earley parsing? If it’s different, how so? I’ve recently begun to read Aho et al.’s Compilers, and I’m happy I did so before reading your series. Makes it far easier to follow. Just a technical question from blogger to blogger: what tool did you use to generate those graphs? I intend to write a series of blog posts about the thermal simulation of buildings, which also makes heavy use of graphs and nodes. I’d very much appreciate it if you would share. What do you think about generalized parsing vs PEG parsing with left recursion? This post helped me to track down a problem in my parser. Turns out I had some rules that had an exponential amount of possible parse trees. I’m using a parser generator that has automatic backtracking and it was causing the backtracking algorithm to appear to hang. I couldn’t figure out what was going on but when I read this post I realized that had to be the problem. Thanks! Technically speaking, CFGs are generating grammers, not parsing grammars. From that perspective, it’s quite natural that they’re not required to be unambiguous. You don’t speak of generating grammars as “accepting input”. I am eagerly awaiting Part 3. Jules, it is a hack that frankly, doesn’t work right, often generating the wrong parse. Hi, I would also be happy to read the next article of the series – or to see performance improvements for your GLL combinators. In my research group we considered using them last year (IIRC when working on the OOPSLA paper for TypeChef), but we ran away because of the comment “performance at the moment is non-existant” on the project README. Afterwards you seem to say “but for non-ambiguous grammars it’s not so bad, actually we’re faster”, so I’m really confused. Thanks for the articles in the series so far; it’s a fascinating topic. I too would be greatly interested in the next one! Comments are automatically formatted. Markup are either stripped or will cause large blocks of text to be eaten, depending on the phase of the moon. Code snippets should be wrapped in <pre>...</pre> tags. Indentation within pre tags will be preserved, and most instances of "<" and ">" will work without a problem. Please note that first-time commenters are moderated, so don't panic if your comment doesn't appear immediately. Daniel Spiewak is a software developer based out of Wisconsin, USA. Over the years, he has worked with Java, Scala, Ruby, C/C++, ML, Clojure and several experimental languages. He currently spends most of his free time researching parser theory and methodologies, particularly areas where the field intersects with functional language design, domain-specific languages and type theory. He can be reached by email. If you're feeling particularly masochistic, you can follow Daniel on Twitter @djspiewak. All content copyright © 2019 Daniel Spiewak. Distributed under Creative Commons. All code (unless otherwise stated) is licensed under the BSD License.